Front And Rear Tail Fenders. This Bicycle need assembling by yourself !! Foldable single speed bike with coaster brake, ideal for commuting and quick transportation that is easy to carry and simple to store. Perfect for taking on a bus or train on your commute or stashing in your apartment. ADJUSTABLE: Seat Height: 65-90cm/ 25.35-35.1 inch. 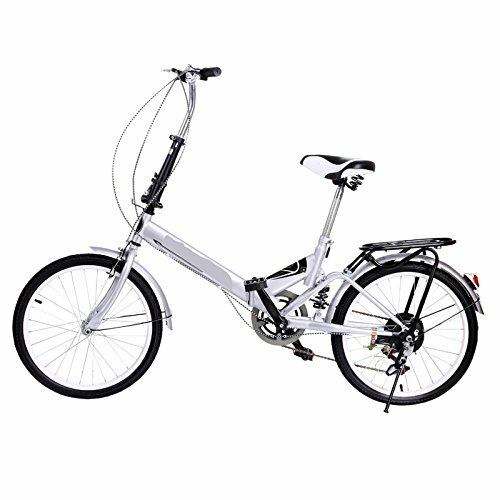 Handle Bar Height: 96-111cm/37.44-43.29 inch. FOLDED SIZE: L75 x H57cm/29.3 x 22.2 inch. Weight: 33 lbs. FEATURES:20" alloy wheels with smooth rolling street tires are perfect for commuting. Front & rear fenders make riding easy in any weather with a rear cargo rack.